The presentation was to be a discussion of the oral histories collected along the Missouri River and a selection of songs from the musical inspired by these stories. The author, Meredith Ludwig, had another idea in mind. She wanted to know if the production could be trimmed to 50 minutes, and presented without set, costumes, special lighting and sound effects. With just some hats, scripts and a narrator, would the audience still get the experience that she wanted them to have? The answer was a resounding, “Yes!” When the cast sang the last chorus of Gumbo Bottoms, the audience jumped to their feet. Even people who had seen the show several times were amazed that the humor along with themes of racial tolerance and need for community were retained. Ludwig has been wanting to take the show to schools, and libraries in river communities that can’t afford the expense of a full blown theatrical production. 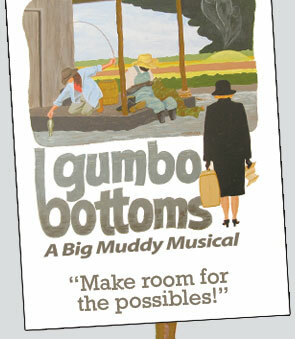 Please contact info@gumbobottomsmusical.com for more information and booking or call 660-537-4139. Sometimes a river is deeper than it looks – or sounds. That’s the case with the folksy musical “Gumbo Bottoms,” a lively, loose-limbed affair that engages topics of race, class and belonging through the story of a genteel East Coast woman who finds her destiny once she reluctantly anchors herself in the Missouri River. Penned by Meredith Ludwig and Cathy Barton, “Gumbo Bottoms” enjoyed its debut in Boonville in 2008 before traveling to towns such as Jefferson City, Hermann and Washington. The show is a mix of aural pleasures and oral history, as Ludwig mined the real-life story of a woman who moved to Missouri in the 1940s for the musical’s book. Missourians can now walk down those same riverbanks, as it were, and revisit the reminders Ludwig and Barton fashioned anytime they please. The cast and a cohort of talented Mid-Missouri musicians preserved the musical for this generation and those to come in January, recording its 13 songs in the studio of one of Columbia’s soundest engineers, Pete Szkolka. The CD will be celebrated with a release party Tuesday at Les Bourgeois Bistro in Rocheport. Framing the vocals of the talented cast – Lesley Oswald, Deb Jewett, Lou Thompson, Willie Cogshell, Steve Jones and Josh Kluck – is a first-rate band featuring Barton, Szkolka, Dave Para, Kevin Hennessy and fiddlers David Wilson and Thomas Verdot. As every manifestation of a musical should, the album begins with an overture. The tune is jaunty and jazzy, its opening fiddle melody finding its way over beds of banjo and mandolin. Spry rhythms abound and tender tones abide as the melody gets passed around like a jug of sweet moonshine, its contents warming the listener from the inside out. Next up, East Coaster Vivian Marks (Oswald) bemoans her fate as she relocates to Missouri - or “Misery,” as she playfully calls it. To Marks, the Show-Me State is alternately a “God-forsaken place to be … a God-forsaken destiny … a God-forsaken country.” Hints and haunts of early 20th-century sounds are threaded through the song, the melody fleshed out through soulful harmonies. The songs here deftly navigate different currents, unpacking big social issues in simple yet evocative terms while liberally sprinkling in humorous, clever turns-of-phrase, both lyrical and musical. The winking, whistling “A Woman Needs A Man” borrows a few melodic bits from French folk tune “Alouette” while “Wiley, Guiley, Mighty Mo” compares a river to a fickle man. As the story is told, a number of other musical references are asserted and articulated. “Cry of the Ancestors” marries an American Indian flute dirge with droning vocals and ringing electric guitars. “Spring Rise” and “River’s Reach” are as lovely and pastoral as any folk tunes you’d hear from the performers at Boonville’s annual Big Muddy Folk Festival. The closing title track is rousing and bounding, as cast members express how the river’s tides have a magnetic pull, drawing and winning even those who once rejected its culture on principle. “Gumbo bottoms are thick with mud / That sticky stuff gets in your blood,” they sing. Cogshell is one of the album’s singing standouts. Whether serving as vocal foil to Jewett on “Wiley Guiley Mighty Mo” or delivering an impassioned, unaccompanied solo to open “Unfree Freedom,” his voice is deep and expressive, conveying much in just the space of a single note. The latter tune is arguably the most affecting of the lot, Cogshell truly immersing the listener in his character’s story and world. As suspect Frenchman Jacques, Jones offers some musical comic relief. The two female leads, Oswald and Jewett, deliver their songs with true theatrical flair, pulling you in and encouraging you to listen close. Barton and Ludwig’s work is the perfect mix of simple string-band glories and the appropriately over-the-top style of musical theater. Those who haven’t seen the show will get a good sense of its story from these tunes, yet will be left craving more. “Gumbo Bottoms” will soon be revived on the stage again – it will be performed aboard the river boat “Queen of the Mississippi” and return to Boonville’s Turner Hall in July. Those who missed the musical in its first iterations – or who became faithful followers – should take advantage of this chance to rehearse the songs in their own minds and homes before hearing them sung underneath a spotlight.